The rapid growth of delivery, especially digital ordering, is offering restaurant operators a bright spot of growth in an industry that has been otherwise flat for several years now. But the rise of delivery is also driving forward-looking operators to rethink on-premise dining. “[Delivery] is one of the only major sources of growth and everybody is starting to get into it, “ said David Portalatin, NPD vice president industry advisor-food. That growth is coming from both major chains with ample resources to create their own online ordering or mobile ordering apps as well as third-party delivery apps, such as Grub Hub, Uber Eats and Seamless, that have provided smaller chains and independent operators the capability to offer delivery. About one-third of delivery traffic initiates from digital from restaurants, 49 percent via telephone, and 13 percent from third-party delivery apps, NPD found. While delivery is more accessible than ever to operators with nearly all kinds of budgets, it’s still quite small, accounting for just 3 percent of all restaurant orders. According to NPD, on-premise still accounts for 37 percent of all restaurant orders. “As delivery grows, it offers [operators] an opportunity to imagine how to set [themselves] apart from competition,” added Portalatin. In addition to growing their delivery business, a host of operators are starting to change the dynamic for what the front of house is, reinventing the on-premise experience to meet the needs of today’s diners and encouraging them to sit and stay. Below, executives from Saladworks and Schlotzsky’s share their approaches to reinventing the on-premise experience in the delivery-age. Even though Conshohocken, Penn.-based Saladworks’ delivery business is growing, accounting for as much as 20 percent of sales at some of its 100 locations, the 32-year-old build-your-own salad chain recently embarked on a systemwide store remodel to meet the changing needs of today’s diners. “Even though there’s an increase in delivery, eating at home, you still have to have a great experience in the dining room,” said Patrick Sugrue, CEO of Saladworks. 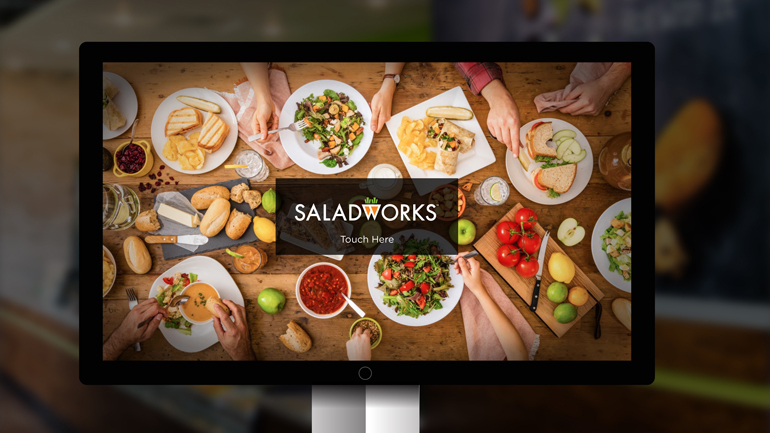 In late July, Saladworks opened its first company-owned, from-scratch store in Atlanta, built on its new Salad 2.0 vision. It’s a smaller store footprint with more efficient seating — including communal tables, two-tops, individual seats at a bar — and high-tech connectedness with free high-speed WiFi and outlets and USB charging stations at each table. Eleven more from-scratch company locations are in the works, and the chain’s 100 legacy stores have been or will soon all be remodeled to varying degrees to align with the new vision. In addition to décor, Saladworks has also revamped its service model, a shift which Sugrue said has increased customer output per hour by 25-30 percent. Part of the effort is the testing of new ordering kiosks in select stores to improve flow and reduce customer wait times. “We’re really trying to engineer what we think consumers want today and 10 years from now,” said Sugrue. A decade from now, will consumers be ordering delivery more than dining in? 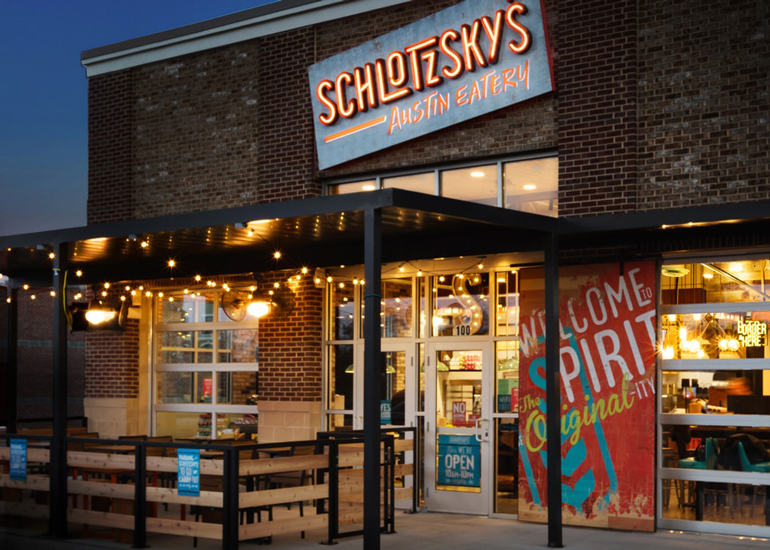 To date, the chain has 18 locations open as Schlotzsky’s Austin Eatery and expects to have the entire system converted by the end of 2019. The new décor, which harkens back to the chain’s Austin roots, features wood details, colorful murals and garage doors that roll up to an outdoor patio with eclectic seating. A new street-food-like menu includes tacos and sliders with slow-cooked meats and a local spirit menu. “Our brand was previously seen as a “lunch-centric” business but with the new menu lineup, engaging dining space and addition of local spirits, our restaurants become more of a destination, which in turn, have helped boost our dinner and weekend business,” added Roddy. Off-premise is still important to Schlotzsky’s, currently representing about 18 percent of business. Driving growth in off-premise is the chain’s recent partnerships with third-party delivery providers Grubhub, Uber Eats and DoorDash. Third-party delivery business, exclusive of drive-thru orders, reached nearly 4 percent of sales in just a few months following the launch, said Roddy. The chain is also working to grow its catering business. Correction: Aug. 24, 2018 This article has been updated to correct the spelling of Patrick Sugrue's last name.